At International Language Services, we are committed to providing our clients with impeccable, high-quality translations to facilitate their communications to new markets and support their international growth. We will expertly guide you through the translation process to ensure that your projects are completed as cost-effectively and painlessly as possible. We take great pride in conveying your intended meaning, so that you can attain your desired outcome. Here’s a look at our service guarantee and why it matters to our clients. Every ILS client is assigned to one of our experienced, dedicated project managers. You are assured of consistent, exceptional service from an accessible individual who understands your specific needs. We use only highly experienced, native-speaking, professional translators who are assigned to your project based on subject matter expertise. A subject matter expert, who fully comprehends your message, localizes it to ensure it is readily understood by your target audience. ILS manages your multiple language projects seamlessly. You convey a single, consistent message for your entire target audience, regardless of how many languages you need. We follow our documented ISO 9001:2015 quality process on every project. Quality control standards are in place and audited to ensure that you receive accurate and audience appropriate certified translations, on time, every time. 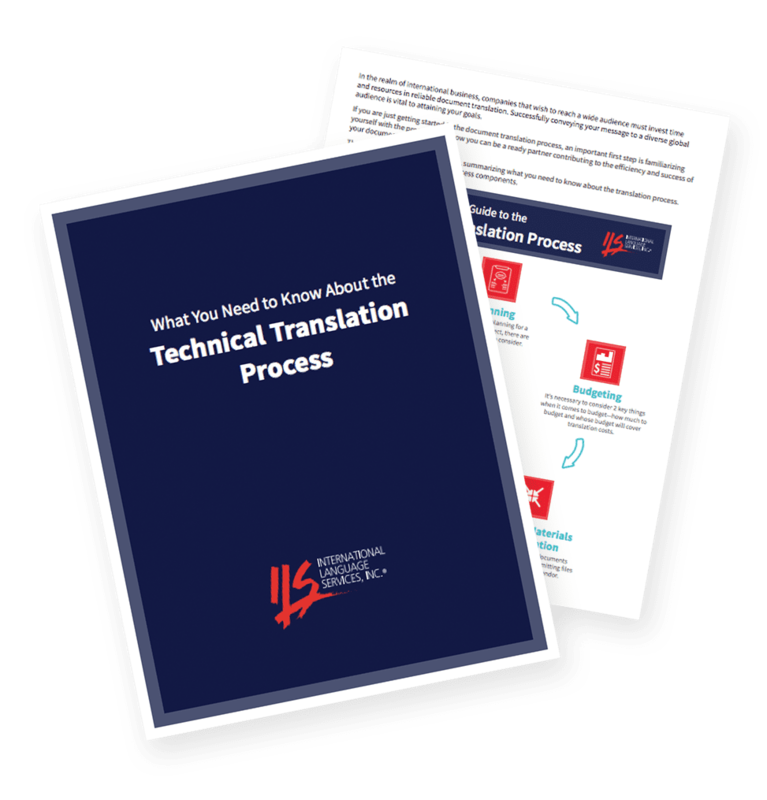 ILS maintains a client-specific “translation memory,” by language, containing your translated phrases. You receive consistently translated terms from one project to the next that reflect your stated preferences. Lead times and project costs are minimized as your database grows over time. Formatting of translated files is available into most commonly used tagged file formats and desktop publishing applications. For little or no additional cost, we deliver translated In Design, Frame Maker, HTML, or XML files (among others), fully proofread and ready for your immediate use. No need for you to cut and paste. ILS project managers build and manage a translation team to meet your project needs. Your translations are consistently completed by a group of language professionals who understand your products and your unique requirements. ILS has been providing quality translations to businesses since 1982. You benefit from the longstanding relationships we have developed over 35+ years with top-notch medical device, industrial, and technical translators. On-time delivery and client satisfaction are continuously measured as part of our ISO 9001:2015 quality assurance process. You can count on the entire ILS team to be fully committed to delivering your completed projects on time. You will receive prompt, professional service at a competitive price for each and every project. At ILS, our conduct always places our clients’ best interests first. We are honest and approachable, and we truly care about your business success. We are highly skilled in our areas of expertise. Our team is uncommonly responsive and highly respectful to our clients and to each another. Of course, we deliver on our promises. But our goal is for you to be delighted working with us—and with the outcome of your project.